breathe in gold light is a current exhibition at New Door Creative gallery in the Station North neighborhood. Curated by MICA Curatorial Practice MFA student Kelly Johnson, breathe in gold light creates a comfortable, dream-like oasis in which women’s bodies are observed as sacred temples: “sites” rather than objective destinations. For her thesis exhibition, the culmination of two years of rigorous collaborative work, Kelly was concerned with commenting on the gender-based hierarchies that still rigidly define the discourse of contemporary art as we know it. A light in itself, this timely exhibition—spanning painted, sculptural and performative works by exclusively local female artists—sheds new (gold) light upon spirituality’s role in a woman’s process of creating. Walking into the space, I am instantly soothed by the dimly lit entryway that smells of decades earlier, when it was built. 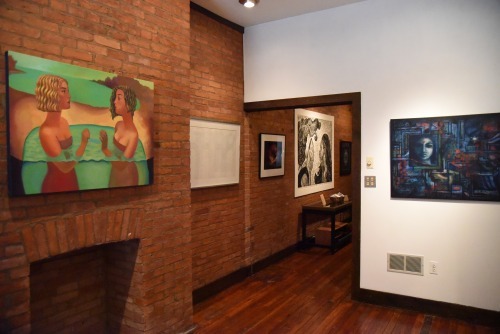 Red brick walls line a majority of the exhibition space, a gorgeous historic feature that supports Kelly’s interests as a curator concerned with re-contextualizing the gallery as a livable, breathable, space through which to view works. As Kelly explained, there are three visual motifs that can be interpreted from the exhibition: portraits, scenes of partnerships and scenes of group exchange, all equally powerful manifestations of female autonomy. Looking around the first gallery, my eyes wander from Mequitta Ahuja’s Dream Sequence: Winged II to the tarnished surfaces of Rachel Rotenberg’s large wooden sculpture. On vellum, a painted composition reads as an ancient scroll on which Ahuja depicts a woman towering over a pastoral village. In the image, the figure exists not just as fearless woman but also as goddess; feathered wings extend out from underneath this protagonist, whose gesture already embodies a feeling of empowerment. Across the way, Rotenberg’s poetically rendered forms in Elizabeth echo the holistic sensibility of Johnson’s exhibition: a sum of parts that reference a larger whole. 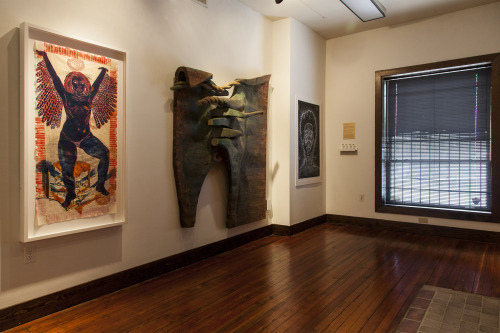 The twelve Mid-Atlantic artists in the exhibition demonstrate the criticality of representation within their given mediums, all or most of which have been commercially dominated by white, male artists throughout history. Evidently, there is strength in numbers as breathe in gold light surveys a vast landscape of cultural traditions and personal histories. As I spoke with Johnson, I gained more insight about the mechanics of the exhibition. She displays a layered consideration for museum and gallery conventions in her minimal use of signage. For breathe in gold light, she feels, the signage and otherwise curatorial jargon had the potential to be too intrusive to the overall inclusionary nature of the exhibition. As a curator, she is more concerned with staging the variety of messages inside these works rather than musing further on their material components. By encouraging us to look beyond an artwork’s physical makeup, Johnson subverts the Modernist impulse to obsess over craft in favor of a more accessible conversation of imagery. Hourglasses were placed throughout the exhibition so that the viewer could meditate alongside artworks to gain perhaps deeper understandings of them. Another critical position on homogenized gallery culture, these signs explained that the average gallery viewer spends an average of six seconds looking at an individual artwork. Here, Johnson takes a political stance on the immediacy of contemporary artworks, giving works with allegorical or narrative structure time to shine in breathe in gold light. Outside the gallery space is a painted labyrinth by Sandra Wasko-Flood. Visible from the St. Paul Street entrance, Goddess of the Universe Labyrinth was commissioned specifically for the exhibition. For thousands of years, these ornately designed mazes have been used to promote peace through wandering and meditation. Furthermore, non-profit organization Living Labyrinths for Peace says that walking a labyrinth can help balance the creative and analytical polarities of your brain. As I traversed through the golden labyrinth with a group of others, I became more aware of my body and also of the bodies sweeping past me, our individual energies fusing into a collaborative activation of the site-specific piece. The mission of the labyrinth echoes that of breathe in gold light in that it simultaneously suggests a venue for individual reflection in the context of a larger community. This depiction of individual reflection is most thoughtfully articulated in the work of Cynthu Muthusamy, the single performative work in the exhibition. In her 2014 piece Soil, Soul, Society, the artist ritualistically creates patterns known as kolam, Hindu symbols that altogether represent creation, destruction and the wavering obstacles one must overcome in life. Muthusamy’s background in printmaking at MICA directly informs the graphic marks she imposes on the street outside her home in Baltimore. As the sun rises in the video, we are again reminded of gold light – and more importantly of the time we are given to breathe it all in. breathe in gold light will continue its programming at New Door Creative, located at 1601 St. Paul Street, through May 19, 2015, with several workshops scheduled before closing.